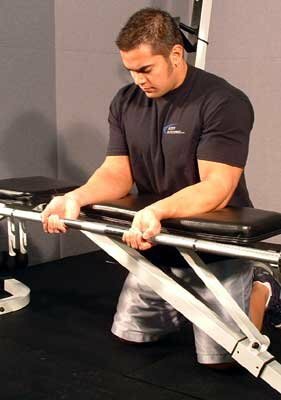 Forgotten Forearms: What Exercises Do You Need To Build Great Forearms? When we think of bodybuilding, we think of arms and abs. When we think of football and soccer our attention turns to giving legs priority status. And sports like soccer and baseball call attention to shoulder joints and rotator cuff tendons. But, the often forgotten forearms are a critical factor in success on the courts, ball fields and achieving physique goals. Although utilized frequently throughout the day, underdeveloped forearm muscles can hold the key to success in breaking through training plateaus and/or taking sports performance to the next level. Not only are forearms rarely, if ever, prioritized in a training routine, they are often completely neglected and forgotten. 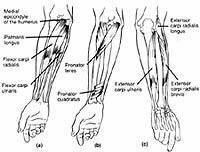 The tiny wrist joint is responsible for adduction, abduction, flexion extension and circumduction. Before we lose you on circumduction, let us explain that it is a combination of movements that allows the hand to move in a circular fashion. 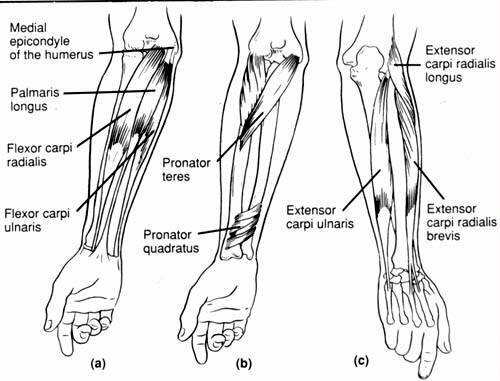 The supinator muscle of the forearm adds the element of rotation or supination, while the pronator teres and pronator quadratus allow for medial rotation of the arm. No wonder the forearms are forgotten! When was the last time you worked your pronator quadratus? Although difficult to remember the many muscles that make up the forearms and hands, these muscles are responsible for grasping and manipulating objects. In bodybuilding terms, each and every time you wrap your hands around a barbell or dumbbell these muscles are used. As a result, your forearm muscles are used in each and every workout. Do you still want to forget about training this muscle group? Dr. Michael Yessis states that the benefits of forearm training includes both enhanced performance and injury prevention, a critical factor to consider when designing a training routine for our baby boomer readers. Even severe injuries such as carpal tunnel syndrome can be prevented through the addition of wrist curls to your training routine. In addition, stronger forearms lead to increased effectiveness while training. Build up your forearms and wrists and you will be able to lift more weight while performing other exercises. You'll be able to hold more weight in your hands, reducing the need for straps. Adding wrist and forearm training into your regime will create strong wrist flexors which will allow your wrists to withstand the stress of the hyper-extended position required for overhead lifts. But, don't forget the added benefit of developing shapely forearms. With your forearms placed firmly on the bench, extend your hands off the edge of the bench to allow for free movement of the wrist joint. Many lifters like to kneel on the floor and face the bench in a perpendicular manner when executing this lift. I prefer to straddle the bench, lean forward and place my forearms firmly on the bench because of my short stature and inability to adjust the height of the bench. But, if height were not an issue, the kneeling position is preferable because you are able to keep the shoulders a little further back which creates additional stress on the muscles involved. Too many lifters make the mistake of sitting on the bench and placing their forearms on their knees. This maneuver should be avoided as it creates an unstable condition for lifting. While balance balls and a discussion of core strength is popular among the spa crowd, maximum, injury-free results are created through overload coupled with proper technique, rather than attempting to balance a long heavy bar on an uneven surface. Use a supinated position, (palms up) to lower and raise the barbell through a full range of motion. A desired rep range of 12-15 is desirable. If the ROM is compromised the weight is too heavy and can result in wrist injury and/or mobility. 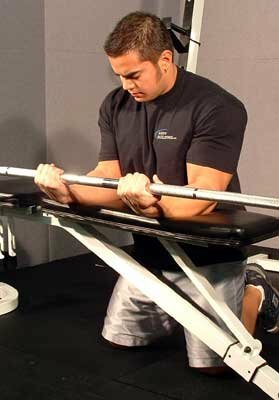 Your elbows should be firmly planted on the bench throughout the entire lift. This insures isolation of the desired muscles. Once you compromise lifting form, other muscles are recruited to execute the lift. 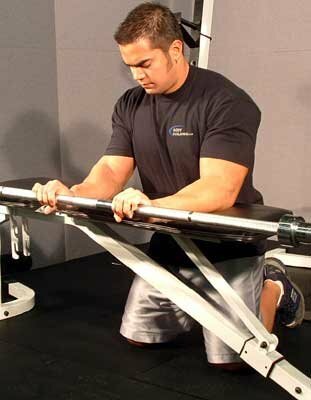 Once again, kneel perpendicular to the bench, placing your forearms on the bench for stability. Hands are extended beyond the bench for full range of motion at the wrist. Keeping your palms down, lift the bar as high as possible and squeeze at the top of the movement. 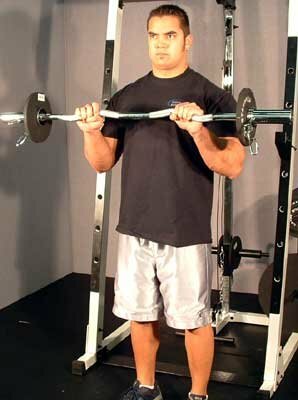 Lower the weights to the starting position. Use a semi-relaxed grip on the barbell to keep the wrist tendons from limiting the range of motion. Set the pins on a squat rack so that the barbell will be at the height of your hands. Back up to the bar and grip the bar slightly wider than shoulder width. Lift the bar up and let the bar roll down your fingers. 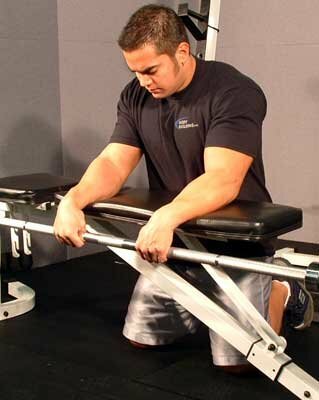 Close your fingers and roll the bar back up for a wrist curl. Use a full range of motion and squeeze the forearms muscles at the top ov the movement. Your arms should be steady with only your wrists moving throughout this lift. This exercise works the forearm extensors, the brachio radialis and the biceps muscle. Grasp a barbell with a palms-down grip that is about shoulder width apart. Use weight that is approximately 60-75% less than your normal weight level for typical barbell curls. Keep your elbows fixed at your side and lift the bar to shoulder height and lower the bar back to the starting position. 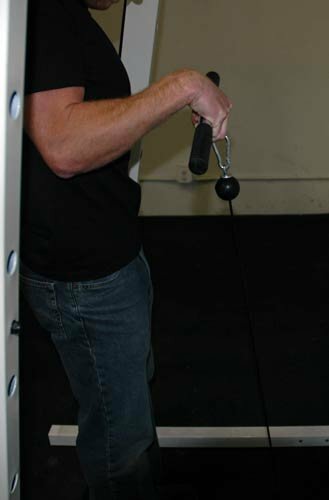 One-arm movements allow for an uncompromised range of motion and maximum muscle isolation. 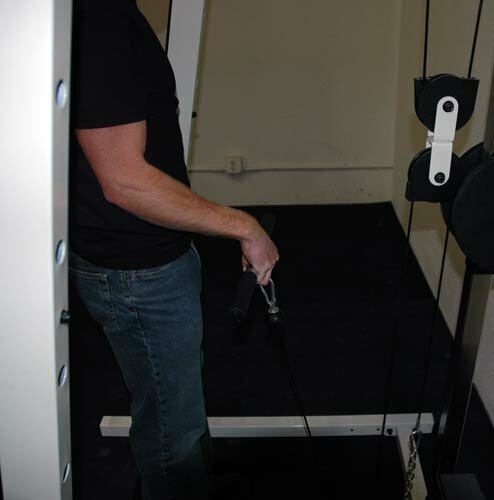 Using a D-ring at floor level on the cable machine, grasp the ring with a palms-down grip. Keep your elbows tucked in at your side and curl your hand up to your shoulder. Shown with Pull-down bar. Use the ring shown to right. 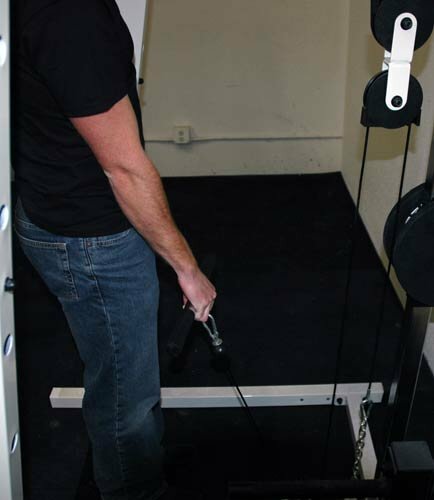 The cable creates resistance on the downward (eccentric) portion of the movement. Completing 12-15 reps with one arm provides an adequate rest period for the alternate arm. Strong, developed forearms helps insure maximum, efficient results in a comprehensive workout routine. At the same time your legendary baby boomer physique is developing, your forearm routine reduces debilitating age-related injuries such as carpal tunnel syndrome. Next time you head to the gym, don't forget to work your forearms. Copyright 2004. Diane Fields, Member. Legendary Fitness, LLC. All rights reserved.